Porter: [voiceover] GSW: that's what the hospitals call it: gunshot wound. Doctor has to report it to the police. That makes it hard for guys in my line to get what I call, quality health care. Q: Is the old British BBFC 18 version uncensored? Q: What is the difference between the director's cut and the original cut? Payback is the third interpretation of Donald E. Westlake's novel The Hunter (1962), written under the pseudonym Richard Stark. A crime thriller novel, the first of the Parker novels. The other films are John Boorman's Point Blank (1967), starring Lee Marvin and Ringo Lam's Full Contact (1992), starring Chow Yun-fat. 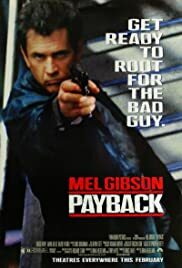 Payback was directed by Brian Helgeland and written Brian Helgeland (screenplay) and Terry Hayes (screenplay), (theatrical cut). Cinematography was by Ericson Core, and music was by Chris Boardman. There are two versions out there the theatrical release and the director's cut. I've seen both versions. The best film version in my opinion would be roughly, the theatrical release with the narration and blue tint then go with the director's cut (but keeping the blue tint) to the ambiguous end. I'd keep the beating also.